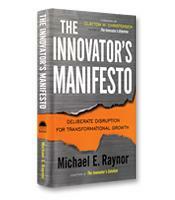 In this compelling book, Michael Raynor, coauthor of the national bestseller The Innovator’s Solution, shows that "Disruption", Clayton Christensen’s landmark theory that explains how fringe ideas come to redefine entire markets, not only explains why new businesses emerge and mature companies fall – it actually helps to predict the future success of new ventures more accurately. Raynor’s groundbreaking research, and deeper understanding of the mechanisms and drivers of Disruption make this approach to innovation more powerful and more useful than ever. Are You On Track With Innovation? Michael E. Raynor is the co-author of The Innovator's Solution, written with Harvard professor Clayton Christensen, whose 1997 best-seller, The Innovator's Dilemma, introduced the concept of "disruption" to the world. Today, disruption is one of the most prevalent and well-respected theories on innovation or, more specifically, on a strategy for displacing powerful incumbents in an industry through disruptive innovation and technology. In The Innovator's Manifesto, Raynor not only describes in detail why disruption can explain the success of so many companies, but argues that disruption can predict what is going to happen. This combination of explanatory power and predictive power solidifies the viability or "truth" of the theory, Raynor writes. As Raynor explains, a new entrant will take over an industry, according to Christensen's theory, in two general steps. The first is to gain a "foothold" in the industry. Traditionally, new companies take on incumbents head on: They try to sell a better widget to the incumbent's best customers. This is what Christensen calls "sustaining" innovation. Disruptive companies take a different approach: They compete with incumbents by selling to customers that the incumbents don't want to reach or can't because of their business models. They can accomplish this profitably through a business model based on some kind of innovation, often technological, tailored to the needs of low-end customers. In other words, disruptive entrants have discovered how to make money where the incumbents cannot. Once they have a foothold, however, these new entrants in the industry begin their "upmarket march" by refining their offerings and improving them over time; eventually the new entrants eat away at the incumbents’ products and customers from the bottom up. Can disruption theory predict whether a new company is going to survive? Raynor describes how one manager at Intel asked that very question. Thomas Thurston was a manager with Intel’s New Business Initiative (NBI), which launches a number of new ventures every year. Thurston examined 48 ventures that had received some support from NBI in the 10 years preceding 2007. Without knowing the results of those ventures — whether they had actually survived to some extent or were completely dead — Thurston made a prediction for each based on whether or not the venture was based on a disruptive strategy or business model. The results were conclusive: 80 percent of the ventures that Thurston predicted would succeed actually succeeded; 95 percent of the ventures predicted to fail actually failed. In the second section of the book, Raynor expands the theory of disruption beyond the sample companies in the experiments described in part one of the book. For Raynor, Southwest Airlines is but one example of an upstart company whose history exemplifies the characteristics of disruption at work — attacking a small underserved segment of air travel, then moving upmarket to become a national competitor to long-established airlines. Of course, entrants with new business models taking on an industry is not new, but these new entrants are not all disruptive companies. Raynor dedicates a chapter to what disruption is not. In the 1950s, for example, Holiday Inn's clean low-cost hotels offered a new business model but it did not disrupt the hotel industry; the top-of-the-line luxury hotels today look much the same as they did before Holiday Inn. Having clearly defined the parameters of disruption — what it is and is not — Raynor proves conclusively that disruption theory can, in many cases, be the only explanation of a new company's success. The next logical step, according to Raynor, is to know how to apply the theory to strategy — how to be, in his terms, successful by being "deliberately disruptive." This is the subject of the last part of the book. Emphasizing autonomy and shaping a strategy based on the principles of disruption are some of the guidelines put forward by Raynor. Future books will probably focus exclusively on how to be deliberately disruptive — moving, in a sense, from "manifesto" to application.